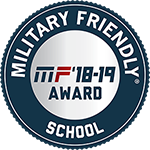 OKCU is a participant in the Yellow Ribbon Program and is a Military Friendly® school. Long-standing history of support for Military and Veteran students - We are veterans serving veterans. Student-teacher ratio: Our small class sizes and excellent student-to-teacher ratio of 11:1 makes the transition to full-time education easier. Plus, you'll receive excellent, personal attention from a professor, not a graduate assistant. Activities: There are 80+ student-led organizations on campus, including the Military Affinity Group. This variety allows you to participate in as many activities as you desire. If there's not a group you like on campus, you have the ability to create one of your own.